It was a gorgeous Vermont summer day. Here's what we did today! There are so many great stories and random things to share that I don't know where to start and it's late enough that it's probably not worth trying in this blog. I do have a story to share that I've been working on this afternoon in my head but I'll drop that in a second blog tonight. One important note is that today was the last day of Serve Preview. On Monday, Tuesday and Wednesday we allow 5th and 6th grade completed Vermont students to spend the day with us for service projects and our evening program. It's a great chance for them to get a taste of something that they'll be invited to spend a whole week with in the future. 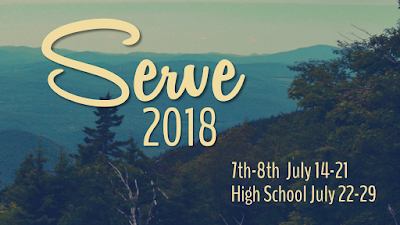 We had seven serve preview students with us and we're looking forward to interacting with them again in the future. Lastly - because this is why you're all still reading (or skimming :)) Here's today's pictures!